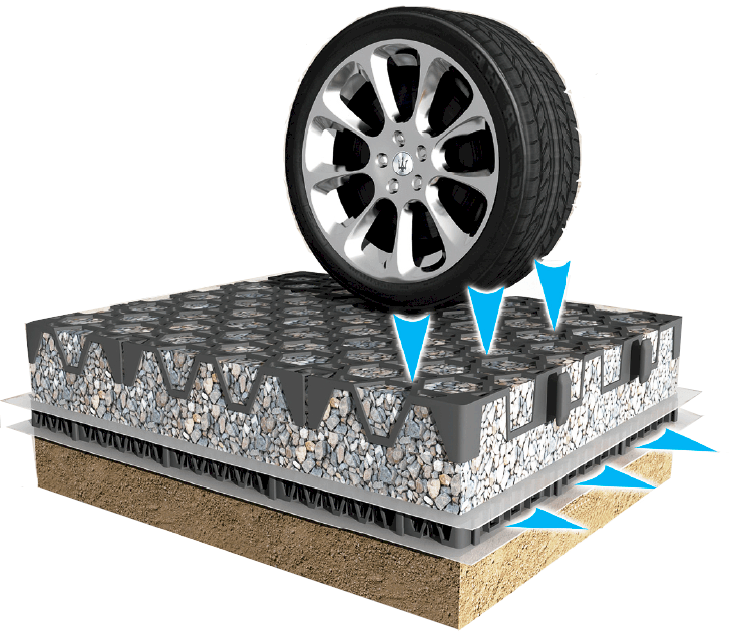 Nero pave allows creating a Permeable gravel surface for parking, or driving. Nero Pave provides a high load bearing capacity while providing a perfect containment of gravel. Extensively used parking surfaces can be maintenance free using gravel filled Nero Pave. Fire lanes are constructed of a hard, all-weather surface capable of supporting the heaviest emergency vehicle and equipments. High confined crush strength of NeroPave offers a fast, economically feasible and proven solution to Fire lanes and Access lane construction. Grassed surface is much cooler reducing the temperature around the building and in turn reducing the Heat Island effect. Collected Stormwater can be reused and possible elimination of traditional stormwater systems. The Nero Pave is supplied in 1.2 sqm pre-clipped panel making it easy to install by unskilled labourer without the use of any heavy machinery. Nero Pave can support heavy loads up to 235 t/sqm unconfined, and suitable for heavy traffic movement. Allows multi directional Root Growth. Unique hexagonal cut-outs and 3-dimensional open grid design allows for unrestricted lateral and vertical root development. which forms an interlockable grid effect once established. Nero pave cell structure provides a protective casing around the grass nodule making grass regeneration quick and efficiently. At the same time provides protection for the root zone from compaction due to Pedestrian and vehicular activities resulting in a naturally looking vegetated surface.